Born in 1908, Glen Fried, was my father who joined AC as a Blockmam in the Memphis Branch in the 1930's. He represented AC in Louisiana, Arkansas and Mississippi, based at Monroe, LA until he volunteered for service in the Army in 1942. Upon return from WWII in 1945 he resumed his job in the Memphis Branch domiciled at Yazoo City, MS. He met and in 1947 married my mom, Geraldine Spotorno, who worked as a secretary at the Memphis Branch. They settled in Yazoo City until early 1949 at which time they moved to Monroe, LA where they remained until his retirement in 1972. Northern Louisiana was a very sparce "block" in the AC dealer network. Despite that fact my Dad was a stellar performer earning honors in "The 52 Club" year after year. I still have my Lionel train that he won as part of his award in 1957. The six Fried kids grew up bleeding Persian Orange. Allis Chalmers put food on the table and we "knew" the AC was the only tractor to have in the field. We would rather have a mule than anything green. We were all part of the sales team. I remember drawing and painting posters, with the new Corporate logo for field days and schools in 1965 or 66 because AC had not yet printed up the new logo. 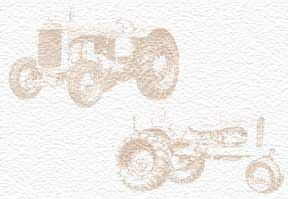 We had many fond memories of traveling with Dad to the many small, 2-3 tractor, dealerships in his district. We were aware of the tough times when AC was weathering hostile take over attempts and down turns in sales and tight money. I remember Dad sweating out closures of a few troubled dealerships, actually camping out in front of some to prevent tractors and parts from disappearing in the middle of the night. Fortunately most of Dad's dealers were great people that became good friends over the years. He knew what it took to keep those small dealers profitable and most appreciated that. I remember one day when I accompanied my dad in the early 70's when he had to tell his good friend and dealer that he was loosing his franchise. We had a close relationship with this dealer. We had broken bread with him and his wife, hunted and cut Christmas trees on his and his brother's farm for years. When we bought our small tractors he was our dealer. It was a very sad day but the personal relationship went on for many years even til after my Dad died as long as the brothers were alive. My Dad retired in 1972 and a number of dealerships closed their doors shortly there after. I was offered the Block in 1976 but I declined knowing my dad's shoes were too big for me to fill.